Four years ago, I was one of the hundred and sixty students undertaking the new BA(Hons) Primary Education degree at Strathclyde University, with the aim of becoming a primary teacher. So, what’s so special about that you may ask? Well, my story is slightly different to that of your “traditional student”, I was on a twenty-five-year career break from education and education and I had not parted on the best of terms first time around! I entered university in 2013, filled with dread about my own academic shortcomings, stemming from school experiences a quarter of a century ago. I felt academically intimidated by all of the students with their A and A+ Highers and somewhat of a fraud knowing of my poor showing at school and having undertaken a year at college to be on an “equal footing”. Reflecting now on my own time at school, I realise the odds were somewhat stacked against me due to a number of factors out with my control; coming from a traditional working-class family, a broken home, alcohol abuse and relocating four hundred miles at the age of twelve from England to Scotland. While I understand there was no guarantee my path of life would have be vastly different, these factors I believe impacted on my confidence and shaped the academic I became at school. Whilst others in my position may have succeeded, I did not have the support, know-how or the skills to reach my full potential at this time. As a result, I became labelled as a failure within the system and was placed in a number of bottom set classes. I then decided to play to the stereotype I had become and even receiving the belt failed to put me back on to the path of enlightenment. (Yes, I am that old they still used the belt back then). I placed no importance upon education, I had no positive educational role models and anyway I was going to be a footballer, who needed qualifications? I left school in 1989, even after a year of re-sit examinations, with six average Standard Grades and stumbling through a range of unskilled jobs for twenty years. I had never considered a return to education, however in 2008/9 my life changed due to the global economic downturn. I was made unemployed from my position as a sales representative and while at the time I was devastated, looking back, it was the best thing that happened in my working career. After a few months, I undertook full time voluntary work in my child’s school, my tentative venture back into education, which continued for a further nine months. Now in my thirties, teachers within my child’s school spotted some potential in me, something the teachers during my own academic years failed to see and they encouraged me to teach. I however saw a barrier to their insight, my academic inabilities which still weighed heavy on my shoulders, even after all this time. It took a further three years for me to gain the confidence to apply for college, a decision I am now delighted I was brave enough to do. My four years at university have been an emotional rollercoaster, I have faced a number of challenges, particularly during the first two years, where I suffered a crisis of confidence and found the assignments at times impossible. On a number of occasions, I considered calling it a day and had it not been for the support of my family and further encouragement from some very special people, I would have dropped out. There have also been some tremendous highs, with gaining a first for my dissertation arguably my greatest academic achievement. After numerous twists, turns and stumbles I have managed to navigate my educational long and winding road. I am immensely proud that I have overcome the odds and my own shortcomings. 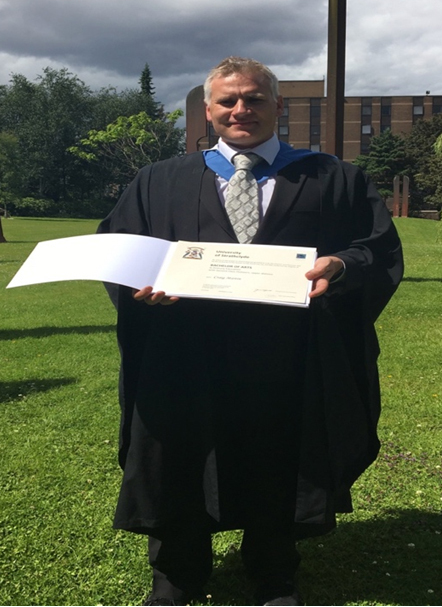 It is a great honour to have graduated from Strathclyde University, I feel extremely privileged to be undertaking my position as a Newly Qualified Teacher and have the opportunity to make a difference to the lives of so many children. My experiences at university have taught me a number of important lessons, with one of the greatest being not to judge a book by its cover. Teachers do not always get their judgements correct and as I have demonstrated some twenty-five years later, the underachiever of today with guidance can always be the star of tomorrow.